Physics Buzz: Pancakes with your nuclei? 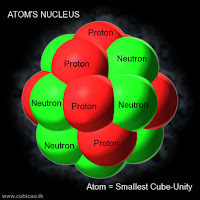 A nucleus of protons and neutrons. Luckily, the liquid drop model of atomic nuclei is not specific about the liquid represented. New research to be published in Physical Review Letters shows that while the protons and neutrons in a nucleus are ordinarily like a drop of water, they're more like syrup if you give them an energy boost. The liquid drop model basically says that the protons and neutrons in a nucleus are like the particles in a drop of liquid. 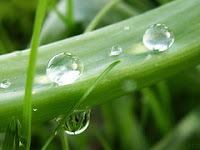 The particles at the edge of a droplet are subject to different forces than those on the inside, namely surface tension. This attractive force pulls nuclei and water droplets alike into spherical shapes. Water droplets, held together by surface tension. Viscosity is a measure of a liquid's resistance to flow. To bastardize a proverb, blood is more viscous than water. Luckily, the physicists who discovered the increasing viscosity of nucleons (protons and neutrons) chose a more pleasant viscous fluid. Measuring the viscosity of something you can't even see is pretty tricky. The physicists, located at Oak Ridge National Laboratory, managed it by accelerating sulfur, titanium, and nickel at different speeds and slamming them into a thin layer of tungsten. The tungsten nuclei are about three times as massive as the bombarding nickel and nearly six times as massive as the sulfur nuclei. The two added nuclei collide to make the sweaty misshapen nucleus in the center (they really are misshapen but maybe not so sweaty). 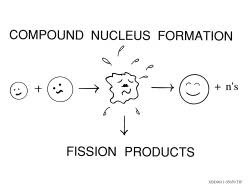 Unlike the diagram, the whole nucleus splits into fission products (after the sweaty state). When nucleus form the beam gets into a head-on collision with a target nucleus, the result is a compound nucleus with a lot of extra energy. There are a couple of ways of getting rid of that energy. One is the ejection of particles, namely neutrons in this case. The other is to emit gamma rays. The last is to fission, or split into two separate nuclei. Waffles, fruit, and syrup. Mmmm. Many of the nuclei did succumb to fission after a mere two "attoseconds" or 2 × 10-18 seconds, or a two billionths of a billionth of a second. But this was actually a little slow. Considering the particles and gamma rays spat out by the nuclei, the researchers calculated how fast the nuclei should have fissioned. The answer? Closer to 10-20 seconds, about a hundred times faster. It's enough to make a physicist wonder what the hold-up is. The team asserts that the nuclei were moving like molasses because the extra energy makes the nucleons act like a more viscous fluid. Voila, a syrup-drop model for energized nuclei. Anderson, J.U. et al. "Crystal Blocking Measurements of the Time Delay of Fission..." Physical Review Letters (forthcoming).